There are painted wooden-clad walls throughout and efficient, thermostatically controlled electric heaters in each of the rooms. Kitchen: a light and airy kitchen with lovely open views across to the riverside. Well-equipped with a double electric oven, a slim-line dishwasher, fridge with an ice-box compartment, coffee machine and a microwave. There's a large glass window through to the dining room. Dining Room: has a table with four chairs (and may be extended to seat up to six guests). There is a hand-painted dresser and local artworks. Laundry Cupboard: housing the washing machine and a heated electric clothes airer. Bathroom: brightly painted bathroom with a bath with overhead shower, hand basin and WC. Sun Room: runs along the back of the house and has glazed doors leading out to the sand dunes, beach and sea. It has a small round table with two chairs and a bench seat. Bedroom 1: colourfully decorated with a small double bed, a chest of drawers, bedside lamp, mirror and clothes hooks. Bedroom 2: sweet room with a single bed, bedside table and lamp, chest of drawers, mirror and clothes hooks. Bedroom 3: located off the dining room and another small charming room with a single bed, chest of drawers, bedside lamp, mirror and clothes hooks. 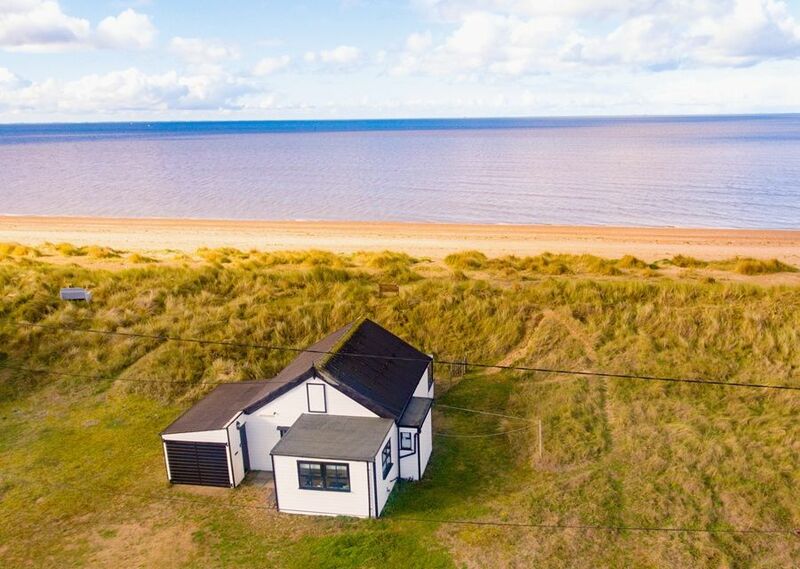 Enviably located towards the far end of an un-made road from the Heacham beach car-park - it is the fourth beach house from the far end. At the front there is plenty of room to park cars. There is an attached garage which houses the tumble drier, an assortment of outside games, additional sun loungers, BBQ and charcoal. It is also a very useful storage space for bicycles, fishing equipment, golf clubs, etc.. There is a gate leading through to a fully enclosed area at the back of the property, with a picnic table and a charcoal barbecue, with another gate which leads straight onto the sand dunes, beach and sea. To enjoy lazy days at the beach, deck-chairs are stored in the sun room. Brincliffe has its own wooden bench in the sand dunes from which to watch the wonderful sunsets.